Don’t let pests in New England threaten your home and family. Homeownership is a big responsibility. Along with home improvement projects, home repairs and the endless “to do” list, homeowners in New England need to be aware of potential pest infestations. While some pests are simply a nuisance like small ants, other pests like rodents and roaches are a bigger threat when they are able to access our home for food and shelter. Pests can spread illness, carry harmful diseases, and even cause structural damage to your home. So to avoid the threat of pests, we must avoid their favored conditions. Our team of New England pest control professionals at Modern Pest Services would like to offer 10 tips to help prevent pests from gaining access to your home and property in Maine, New Hampshire and Massachusetts. Replace any window screens that are torn or broken. Even a tiny tear is enough to welcome insects inside this spring and summer. Fill in cracks along the foundation with caulk and apply weather stripping to doors to fill in gaps. You want to create a tight seal around the entire home to keep pests out. Trim back tree branches so they do not touch the side of the home, creating a bridge for insects to get inside. Apply crushed rock along the perimeter of the home. Even just a small layer of crushed rock is going to make it harder and less likely for rodents and even insects to reach the exterior of the home. Remove clutter from inside the home including from the attic and other storage spaces. Clutter promotes an environment in which pests can thrive because they go unnoticed for a longer period of time. Deep clean the kitchen to remove built up food debris from under and behind appliances. Even grease on the stove can attract ants and other pests. Continuously wipe away crumbs and spills from the kitchen and dining room. As soon as ants find access to food, they will continue to come back for more. Worse they’ll leave a pheromone trail for all their friends to follow. Make sure all open food is stored in airtight containers on the counters and in the food pantry. Get rid of excess moisture from bathrooms, kitchens and basements. Wipe up water from the sink and install vents or fans to keep moisture to a minimum. Some basements may even require a de-humidifier to keep excess moisture down. Remove sources of stagnant water from around the property to eliminate mosquito breeding grounds this spring and summer. After implementing these pest prevention tips, it is still possible that pests will find their way inside. After all, it only takes a hole the size of a dime for small mice to squeeze through. So if you are finding evidence of pest infestations such as chew marks on furniture, droppings, or the live critters themselves, please contact Modern Pest Services! Our HomeCare Green program includes a complete evaluation of the home and property to implement a pest control plan that will get rid of pests in the home now and prevent infestations in the future. 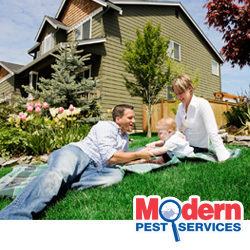 Modern Pest Services provides home pest control services in Maine, New Hampshire and parts of Massachusetts. Contact us today for more information.